I was not born into the Orthodox Presbyterian Church. I was adopted into it. After I was converted in 1970, my first exposure to Presbyterianism was in the Reformed Presbyterian Church, Evangelical Synod (which, in 1982, became part of the Presbyterian Church in America). Throughout my seminary days at Westminster Seminary in Philadelphia (1976–1979), I remained a member of the RPCES, although, for most of that time, I attended an Orthodox Presbyterian church and did my internship there as part of my last year of seminary training. 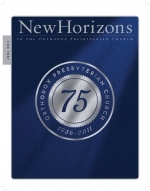 When I was first invited to submit this article, I considered what matters of praise I could lay before the Orthodox Presbyterian Church on her seventy-fifth anniversary. Instead, my mind quickly followed a familiar path to some of the external characteristics that tend to define and discredit this remarkably gifted body of believers with whom I am associated and whom I love. My parents were members of Calvary OPC in Cedar Grove, Wisconsin, where my father and grandfather were charter members. I was baptized in Calvary Church by Pastor George Willis.